As we often say, one of the easiest ways to give your kitchen a new look without breaking your budget is with kitchen cabinet refacing. By replacing all of your cabinet doors and drawers and resurfacing all other visible cabinet surfaces, you can sustainably and affordably revitalize the appearance of your kitchen while increasing the durability of your cabinets. 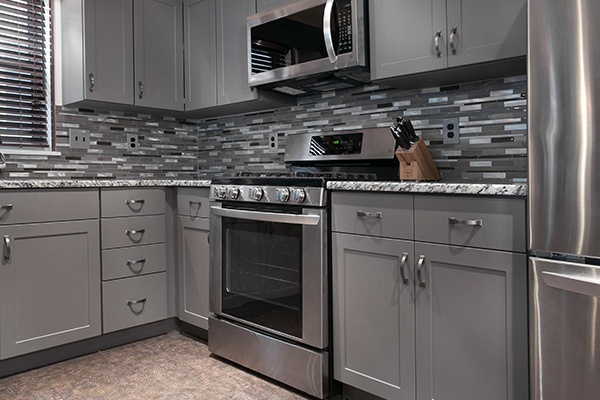 When you get started with a cabinet refacing project, you have an abundance of style options available to you, in terms of materials, colors, and door styles. Many assume that cabinet refacing is a laminate-only remodeling solution, but that is simply not the case. Wood cabinet doors are a classic choice and lend traditional elegance to your kitchen’s design. 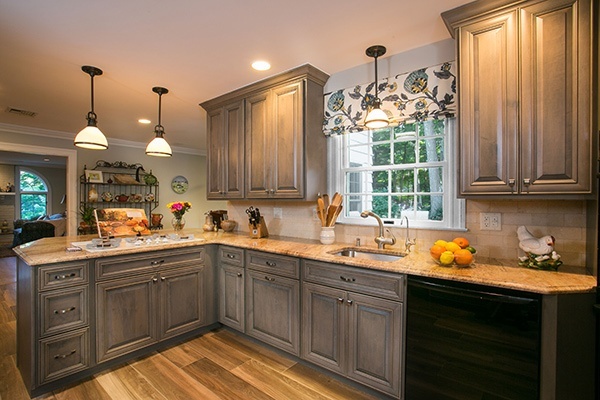 Real wood cabinetry does require a little more care and maintenance than some other options, but the natural beauty of wood helps it remain a popular choice for cabinet refacing projects. A rich range of colors, textures are available in wood doors, as a variety of stains and glazes are hand-applied to several different types of wood, including red oak, maple, and cherry. Combined with a wide selection of door styles with plain or raised panels, you can easily find the ideal wood cabinet doors to match your vision for your kitchen design. Another increasingly popular door choice for cabinet refacing is laminate—and it’s a wise choice, to boot! The huge benefit of laminate doors is that they are easy to clean and to maintain, resisting damage from humidity and other environmental conditions more readily than other materials. Laminate cabinet doors come in a truly impressive range of color and texture options. You can choose styles that perfectly mimic the appearance of wood grain or that have a smooth and durable matte. 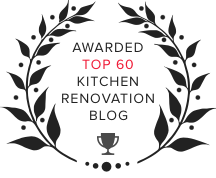 If you enjoy having the flexibility to change the appearance of your kitchen every few years, laminate doors are easy to paint for an entirely new look later. With all these options, laminate cabinet doors are an excellent choice to help you design the perfect kitchen. 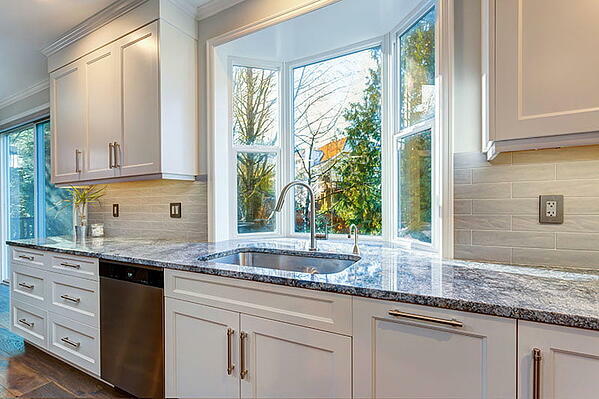 Glass-front cabinet doors add a little something-special to a kitchen’s appeal. 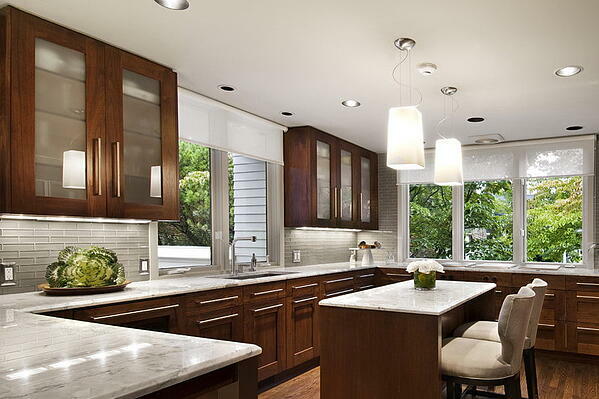 Some clients choose to go with all glass-front uppers, and others go for one or two placed glass cabinets in stylishly strategic areas of the kitchen. There are some uber-creative ways to incorporate glass cabinets when remodeling a kitchen, and that can make all the difference in terms of a room’s wow-factor. Available in a variety of architectural styles, there are options that allow you to display treasured china, or frosted versions that will hide any unsightly cabinet contents. 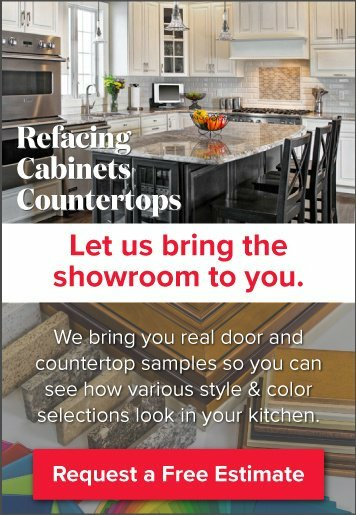 Ultimately your choice of materials for your cabinet refacing project will be guided by your personal tastes and preferences. With these three cabinet door options, you can create practically any look for your kitchen. Want to see some samples of these doors in your kitchen to see how they would look? Schedule a free in-home design consultation, and we’ll bring the showroom to you!